This was the opening rubber of the match and Iain Laing seemed to take a while to get going. In the first game Iain made several unforced errors that were uncharacteristic of his usual precise play and found it hard to read Bobs game, a lot of the points in this game were serve and volley as rallies were few and far between, Bob took the first 15-12. Iain seemed to find rhythm more in the second game and cut out the errors. Iain varied his shots and played a lot of cross court shots as opposed to down the line, but these shots were being reached well by Bob and this was a close 15-10 to Iain. Iain changed his game in the third and was playing full length down the wall shots, theses were good enough to win the points and the rallies extended the more the game went on. The fourth game seen the best squash, Iains placement was perfect and Bob would respond with tight drop shots and both players tried to out think each other. At 14-14 The match went to Tie Break but the Borderer found the extra bit of speed when it matered and took it 17-15 for a 3-1 victory. Another match that had close fought games was the fourth seeds, Pat Spence who was usually further up the pecking order but due to Piers introduction to the team Pat had the slightly easier task of fourth seeding. It was a close fought match with the games going 15-11, 16-14, 13-15, 15-9 to Spence. The players had a similar style of squash, and this meant both players were reading the game well. Schultz felt at times there were a few contentious decisions by the referee and felt hard done by, this possibly caused a lack of concentration from the Fifer but Spence made the key shots when it mattered and took another 3-1 victory for the Reivers. Another exciting 3-1 match, but this time it was Kirkaldy that won the rubber. Piers enjoyed some long fast rallies in this game and the skill from both players was evident. Another close tie that had many long rallies but a few shots that didn’t find the corners from Piers meant Mel would capitalize and motor on to take the games. Indeed at 14-13 up in the third game Piers made the school boy error of serving out and Mel took that one 16-24. The match was exciting and close but Crockatt won 12-15, 15-11, 16-14, 15-13. Andy Cant was usually the Kirkaldy Clubs top seed but due to the return to finess of Drummond, Cant got the “easier” task of second seed. Unfortunately for Cant, Hosny was firing on all cylinders and was on-form, the concentration and focus from Hosny meant he was equal to most of Cant’s shots and a good disciplined performance meant Hosny took the first 15-7. The second game the Kirkaldy Stalwart varied his shots and played some boasts that were made to look like the ball was going the other way, but Hosny maintained focus and kept his eye on the ball this was another game of skill 15-13 for Hosny. In the third game Cant played full length tight shots and Hosny responded in kind, this game went on the longest as some of the rallies seemed to go on and on; Hosny held out for another 15-13. Although Drummond was the strongest player for Kirkaldy, he met an in form Elliot. Tony Elliot took most shots early and this meant Drummond couldn’t tell where the ball was going to go until it was on the way back to him, and Elliot played with such pace that most balls were passed Drummond before he could adjust his stance. Elliot took it 15-5, 15-9, 15-9. Club Captain Del Sharratt said after the match “We were fortunate tonight that the Reivers players all brought their A-Game at the same time. This is the stongest line-up we have fielded all season and Kirkaldy are top of the league so that shows how good the Boys played. I was particularly pleaed with Hosny’s demolition of Andy Cant, that is a Scalp and hopefully we can carry momentum on for the rest of the season with a few victories and work our way up the top half of the table. Ruaridh was making his first appearance of the season for the Border Reivers; although was no stranger to team squash having had caps in previous seasons and regularly playing for Stewarts Melville Old Boys in clubs around Edinburgh. Kohler started well, using his trade mark Boast to wrong foot Ferguson and win several points. Ferguson seemed a bit sluggish off the mark but his accurate shots made up for it and Ferguson won the first 15-12. The second game was marred by several contentuous referee decisions, Kohler felt his opponent was getting strokes for 50/50 calls and this upset the Borderer so much that he couldn’t focus on the game, this happened on several shots and both players lost their eye through it but Ferguson held up for 15-10. Both players were tense and had lost concentration, the match had lost it’s flow and there was still some niggles in the third game when Ferguson would stop and claim lets on several shots he could have reached. Kohler just never regained concentration and lost 15-10. Sharratt found it difficult to find any rhythm in this match, although Sharratt felt he was easily a match for Jones, Jones seemed to win all the close rallies and dominate the court. Sharratt struggled to find tight shots and although here were some decent rallies the Linlithgow boy made the match lookeasier than it actually was. It was a decisive 15-12, 15-9, 15-10 victory in the end. This was a classic squash match and the tie of the match. Wilkinson was making his debut for the Reivers; but had previous experience in higher Leagues with The Grange in previous seasons. John smith had played in the West Leagues most of the season with Loch Leven but was turning out for his home club Linlithgow in this tie. Smith had the fastest shot of the teams and Wilkinson had to keep on his toes to rach the ball before the shot past him, although Wilkinson used the back wall repeatedly to let the ball come back to him before playing it and this made for a good skilful match. Smith proved too fit and powerful in the first game and took Wilkinson a bit by surprise, although the Borderer Battled well it went 15-8 to Smith. In the second game Piers was getting to know John’s style, and although John still played tight fast shots, Piers found he could return them better; John made a couple of silly errors and his head went down a bit, Piers took it 15-12. Almost nothing could separate the players in the third game, as it turns into an exhilliarating tie. Wilkinson actually came from 11-8 down to win 15-13 a lot of this due again to Smith making a silly error and beating himself up about it. In the fourth game Wilkinson seemed to get to everything until he was 11-8 up, then a poor serve from Piers let Smith back in and in no time Smith was suddenly 12-11 up and everything he played was tight – this was remeniscant of the first game and Wilkinson had no reply as Smith triumphed 15-11. At 2-2 Smith came out the blocks running and seemed to miss nothing as he dominated the court and Wilkinson found no way past Smith, Smith won 15-10. Reivers Vice-captain Spence showed his dedication to the team as he had drove to the match straight from Edinburgh Airport having just flew in half an hour before kick off. 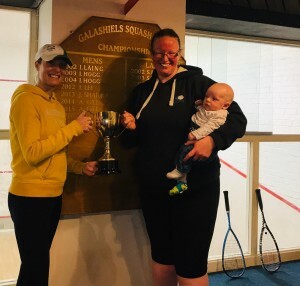 Ashley, who has been Linlithgow Ladies Champion on several occasions may not have the power of Pat but had the knack of slow placed shots that were unretrivable. Spence did miss the ball on several occasions and mad some uncharacteristic errors, may have been due to fatigue from the flight. But all credit to Mears who proved why she merits a place in the Linlithgow team with a comprehensive 15-10, 15-8, 15-8 victory. Tony was at his best during this match and won 15-7, 15-5, 15-10 and although Kent ran every inch of the court and didn’t show signs of wearying, Elliot was just too good on the night; although Kent got close in the third game, Elliot always had a higher gear in reserve if he needed it. But Elliot was never really under threat and got the Reivers only victory of the night.